The Peterborough-based Burns Unit Appeal Fund (BUAF) has handed over a cheque worth £880,000 to support the treatment of burns victims from across the region. Following three decades of fundraising, the BUAF will hand over the final fundraising sum in April. The money has been accumulated through both fundraising and investment and concluded with a celebration event held in Peterborough in February. Over £80,000 will be allocated for outreach services in Peterborough to support victims of burns. 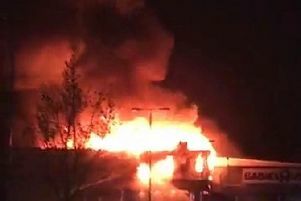 The remaining funds will be handed over to the devoted Burns Injury Unit of Broomfield Hospital, Chelmsford, which looks after all burns victims from the East Anglia region. The money will be spent on in-patient treatment, research and accommodation needs for family and visitors. The appeal fund will then close after nearly 35 years of fundraising. The only remaining trustee, Jan Whitbourn of Spalding, became involved in the local charity after her daughter Natalie poured scolding kettle water onto herself as a one-year-old. Jan said: “After over three decades of fundraising we are delighted to hand over such a large sum of money to support work across Peterborough and to the Burns Injury Unit at Broomfield Hospital in the knowledge that it will be used to support victims of serious burns from across the Eastern region. “The appeal means a lot to me and I am thrilled with the fundraising efforts that have contributed to the final amount. “It is a credit to all those who were involved, especially the late Sheila Conning and her team, that this money will go on to support burns’ victims and their families for many years to come. Falklands War burns victim and campaigner, Simon Weston, attended the celebration event in February and has consistently shown his support for the BUAF. He said: “To me, it was such a thrill to hand over almost a million pounds of funding as every penny is needed, especially in specialist departments like the Burns Injury Unit. “Often, unless you’re affected by burns or you are the friends or family of a burns victim, you don’t fully understand the long lasting effects that it can have. “But when you see first-hand you quickly realise why funds like these are so important. Jan Whitbourn, Simon Weston OBE, Nick Alston CBE (Non-Executive Director, Mid Essex Hospitals Trust), Peter Dziewulski (Clinical Lead, St Andrew Burns Service) and Kevin Woodthorpe (Accountant). Joining Jan and Simon at the cheque handover were: Nick Alston (non-executive director, Mid Essex Hospital Services NHS Trust), Peter Dziewulski (clinical lead, St Andrew’s Centre for Plastic Surgery and Burns) and accountant Kevin Woodthorpe.